What makes a company an employer of choice? Based on almost 30,000 employee interviews, this report contains detailed results and data for more than 1,800 large and mid-size American employers. 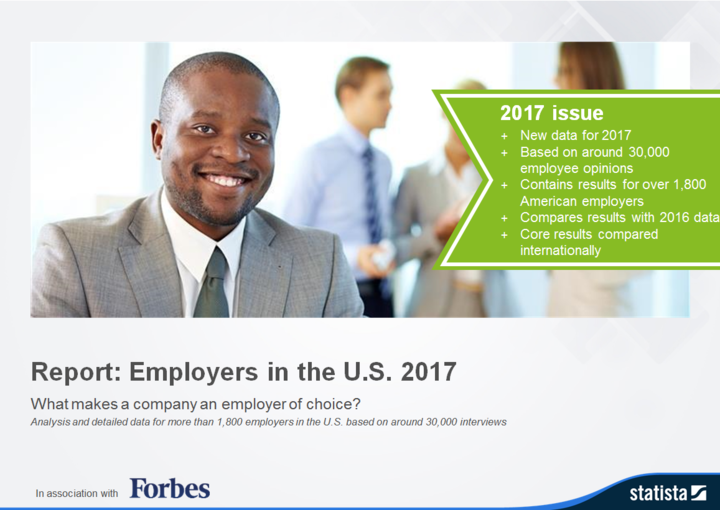 For the third time Statista.com, in partnership with Forbes, surveyed 30,000 American employees in order to determine the best employers in the U.S. and understand what drives American employee satisfaction. Using online access panels, Statista.com and Forbes have anonymously and independently surveyed 30,000 American employees. Based on the results of this survey, over 1,800 large and mid-size employers from 25 industry sectors have been given a score. • International comparison of results from surveys conducted in Canada, France, Germany and Austria; including a detailed analysis of the Canada ranking by region, industry and sociodemographic characteristics. The PDF presentation contains an analysis of results laid out in a professional and easy to read format, using graphical representations. In addition to the employer’s individual score and ranking, drivers of an employer’s attractiveness are analyzed and ascertained for each of the 25 industry sectors and sociodemographic groups, etc. The first Excel document contains all individual scores, driver values and additional information for over 1,800 large and mid-size employers. The reading sample contains an overview of the results included in the report and an overview of all surveyed employers.